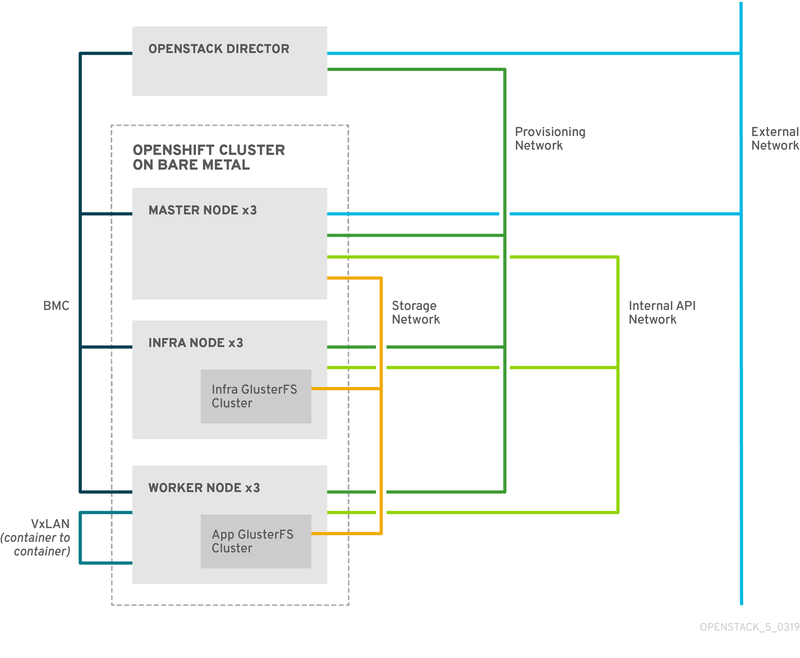 This guide explains how Red Hat OpenStack director can deploy Red Hat OpenShift Container Platform (OCP) clusters onto bare metal nodes, or in virtual nodes in an overcloud. If you are deploying into a virtual environment, see Section 1.3, “Deploying in a virtualized environment” below. Working undercloud - A completed installation of the Red Hat OpenStack director undercloud; the OCP deployment will serve as part of the overcloud. Storage requirements - The openshift-cns.yaml template configures two different GlusterFS clusters: one on the Infra nodes for the container registry, and another on the Worker nodes for the workload. As a result, to get quorum you will need at least three Infra nodes and three Worker nodes. In addition, each Infra and Worker node requires a minimum of one additional disk (other than the OS disk) for gluster storage. The list of disks is defined by the OpenShiftGlusterDisk parameter, as described in this guide. Using Gluster storage: Minimum of 3x Master, 3x Infra, and 3x Worker nodes. This provides full High Availability (HA). Using local storage: Minimum of 3x Master, 2x Infra, and 1x Worker node. This provides HA for services running on Master and Infra nodes, but not for the storage used by the registry and apps. You can use director to deploy Red Hat OpenShift Container Platform (OCP) clusters onto bare metal nodes. Director deploys the operating system onto the nodes and then configures OCP using openshift-ansible. You can also use director to manage the bare metal nodes. Director installs the OCP services through composable roles for OpenShiftMaster, OpenShiftWorker (also known as the application node), and OpenShiftInfra. When you import a bare metal node using instackenv.json, you can then tag it to use a specific composable role. For more information on using composable roles, see https://access.redhat.com/documentation/en-us/red_hat_openstack_platform/14/html/advanced_overcloud_customization/roles. Director does not manage updates or upgrades for OpenShift. You should instead follow the recommended OpenShift upgrade paths. The network that director uses to provision bare metal nodes and configure these nodes with their respective roles. The network that director uses to control the bare metal nodes with a baseboard management controller (BMC). The network that director and OpenShiftMaster nodes use for external traffic. The network that bare metal nodes use for GlusterFS traffic. The internal OpenShift Container Platform network that containers use for communication with other containers. This procedure generates the OCP roles so that you can later assign them to hardware nodes. The result should include entries for OpenShiftMaster, OpenShiftWorker, and OpenShiftInfra. After you deploy the undercloud, you must configure director to locate the container registry. This procedure describes how to enroll a physical node as an OpenShift node. This file is executed later as part of your openstack overcloud deploy, described later in this guide. Create a file named openshift_env.yaml. This defines the OpenShift-related settings that director will later apply as part of the openstack overcloud deploy procedure. To complete this information, you will need a working DNS and NTP environment, and your IP address allocation strategy must already be defined. You will also need to know how you intend to segment your network for internal and external access, your OpenShift storage strategy, and how you plan to authenticate OpenShift users. CloudName - The DNS name of your OpenStack deployment. This entry must resolve to the public VIP. PublicVirtualFixedIPs - By default, director assigns the VIP randomly from the allocation pool. You can override this here. CloudNameInternal - The DNS name of your Internal API. This entry must resolve to the internal VIP. InternalApiVirtualFixedIPs - By default, director assigns the VIP randomly from the allocation pool. You can override this here. OpenShiftInfraParameters - For OpenShiftInfra role nodes, only required for container native storage (CNS) deployments. Use with OpenShiftGlusterDisks to list the disks to be used for GlusterFS. OpenShiftWorkerParameters- For OpenShiftWorker role nodes, only required for CNS deployments. Use with * OpenShiftGlusterDisks to list the disks to be used for GlusterFS. NtpServer - Define multiple NTP server entries here. ControlPlaneDefaultRoute - Add the IP address of the gateway to the provisioning network. This parameter can be used inside the NIC templates, and define the default route on the ctlplane network for non-master nodes. EC2MetadataIp - Add the IP address of the EC2 metadata server. This might also be the IP address of the undercloud node. ControlPlaneSubnetCidr - Use CIDR of the control plane network. DnsServers - The DNS server must be able to resolve the DNS entries described in this file, such as internal,public,apps. The following are openshift-ansible parameters, and should be placed under the OpenShiftGlobalVariables Heat parameter. openshift_master_identity_providers - Allows you to define the identity provider and its supporting settings. For example, * htpasswd_auth will require login and name, among others. openshift_master_cluster_hostname - This value must match the CloudNameInternal parameter. openshift_master_cluster_public_hostname - This value must match the CloudName parameter. openshift_master_default_subdomain - Allows you to define the subdomain that is given to new applications. You can find examples of these YAML files below in Section 1.6, “Example YAML files”. Your overcloud nodes require access to the OpenShift repository to install the OCP packages. To configure RHSM in your director-based deployment, see https://access.redhat.com/documentation/en-us/red_hat_openstack_platform/14/html/advanced_overcloud_customization/ansible-based-registration. Obtain a RHSM account from your administrator. Identify the right pool ID to use. For more information on general RHSM usage, see https://access.redhat.com/documentation/en-us/red_hat_subscription_management/1/html-single/rhsm/index. For information on creating the /home/stack/rhsm.yaml file, see https://access.redhat.com/documentation/en-us/red_hat_openstack_platform/14/html-single/advanced_overcloud_customization/index#registering-the-overcloud-with-the-rhsm-composable-service. Do not use OVS bridges (including os-net-config managed) on the OCP bare metal nodes; instead you should consider using Linux bridges or bonds. For more information on the interface settings, see https://access.redhat.com/documentation/en-us/red_hat_openstack_platform/14/html-single/advanced_overcloud_customization/#network-interface-reference. To check the status of the deployment process, use openstack overcloud status. For more information, see https://access.redhat.com/documentation/en-us/red_hat_openstack_platform/14/html-single/director_installation_and_usage/#checking-overcloud-deployment-status. When the overcloud deploy procedure completes, review the state of your OCP nodes. List all of your bare metal nodes. You should see your master and worker nodes. This procedure describes how to create a test application in your new OCP deployment. Logged into "https://192.168.64.3:8443" as "developer" using existing credentials. You have one project on this server: "myproject"
Now using project "test-project" on server "https://192.168.64.3:8443". --> Found image 9dd8c80 (29 hours old) in image stream "openshift/php" under tag "7.1" for "php"
PHP 7.1 available as container is a base platform for building and running various PHP 7.1 applications and frameworks. PHP is an HTML-embedded scripting language. PHP attempts to make it easy for developers to write dynamically generated web pages. PHP also offers built-in database integration for several commercial and non-commercial database management systems, so writing a database-enabled webpage with PHP is fairly simple. The most common use of PHP coding is probably as a replacement for CGI scripts. * The resulting image will be pushed to image stream "cakephp-ex:latest"
* This image will be deployed in deployment config "cakephp-ex"
* Ports 8080/tcp, 8443/tcp will be load balanced by service "cakephp-ex"
* Other containers can access this service through the hostname "cakephp-ex"
Build scheduled, use 'oc logs -f bc/cakephp-ex' to track its progress. * dc/cakephp-ex has no readiness probe to verify pods are ready to accept traffic or ensure deployment is successful. * dc/cakephp-ex has no liveness probe to verify pods are still running. $ curl -s 172.30.171.214:8080 | grep "Welcome"
Previously, OpenShift Container Platform (OCP) assigned a subnet to each node. OCP 3.10 now uses Kuryr to allocate a subnet to each network namespace. For more information, see https://access.redhat.com/documentation/en-us/openshift_container_platform/3.10/html-single/configuring_clusters/#install-config-configuring-kuryr-sdn. For more information about installing OpenShift Container Platform clusters, see Installing Clusters. For more information about configuring OpenShift Container Platform clusters, see Configuring Clusters. This section describes validation procedures to follow prior to deploying in a virtual environment. Ensure that you have installed Red Hat OpenStack director. Run the hardware and network requirements validations. You can run these validation either from Red Hat OpenStack director, or using the command line. These are described in the following section. To open the Validations panel, click the validations icon at the top right of the window. To run an OpenShift validation, select the required validation from the list and click the play icon. If the validations fail, you can still attempt to install OpenShift, however, it is advised that you fulfil the requirements of the validation before you install OpenShift. The default plan used in a director installation is named overcloud. If you are working with your own set of heat templates, use the name you chose when creating your custom plan. Once the validations have completed, to install and configure OpenShift on OpenStack, see https://docs.openshift.com/container-platform/3.11/install_config/configuring_openstack.html. This chapter contains procedures for managing your OCP nodes. This procedure explains how to scale out your OCP deployment by adding more Master, Infra, or Worker nodes. This output lists all the OCP nodes, including Master, Infra, and Worker (compute); all of them should be in the Ready state. To remove a worker node, you will need to remove it from both the overcloud and OpenShift. This section explains how to replace a master node. Use openstack overcloud deploy to deploy the replacement master node. For more information, see Section 1.2.7, “Deploying the OCP nodes”. FAILED - RETRYING: Add new etcd members to cluster (3 retries left). FAILED - RETRYING: Add new etcd members to cluster (2 retries left). FAILED - RETRYING: Add new etcd members to cluster (1 retries left). This occurs because the node being removed is still an etcd member. As a workaround, you can manually remove the node from the etcd cluster, as described in this section. Message:  CA certificate /etc/etcd/ca/ca.crt doesn't exist on CA host openshift-master-2. Apply 'etcd_ca' action from `etcd` role to openshift-master-2. The following procedure will permanently delete your entire overcloud deployment, including all instances and physical nodes. This step will permanently delete your entire overcloud deployment, including all instances and physical nodes. You can use openstack stack list to determine whether the deletion process has been completed. Once the deletion has finished, re-run the openstack overcloud deploy process. Software Config to drive os-net-config with 2 bonded nics on a bridge with VLANs attached for the Openshift Master role. Software Config to drive os-net-config with 2 bonded nics on a bridge with VLANs attached for the Openshift Infra role. Software Config to drive os-net-config with 2 bonded nics on a bridge with VLANs attached for the Openshift worker role.